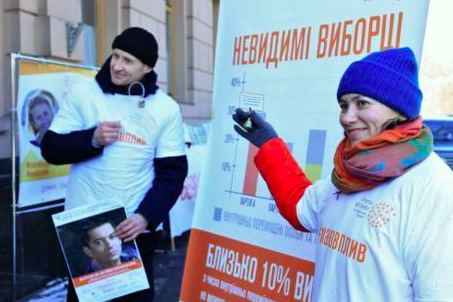 The campaign "Invisible voters", Kyiv, March 20, 2018. Source: Civic Holding Group "Vplyv". It is 11 May 2014. Local residents in Dobropillya, a town in Donetsk region, are crowding round the only organised “polling station” on the main square – they have come to vote for “Self-determination for the ‘Donetsk People’s Republic’”. No one is paying any attention to a small tent with Ukrainian insignia across the road. Here, members of the local self-defence militia (loyal to the Kyiv government) are holding a “referendum” on a merger between Dobropillya and its neighbouring Dnipropetrovsk region. In Dnipropetrovsk, oligarch Ihor Kolomoisky, the region’s current governor, has taken on the task of defending his native region against the “Russian Spring”. Precisely two weeks later, thanks to Kolomoisky’s Dnipro-1 battalion and the same self-defence forces, the Dobropillya district will have become one of the eight districts in the Donetsk region where residents will be able to vote for a new Ukrainian president after the flight of Viktor Yanukovych. The remaining 14 districts will be occupied by armed forces, and the members of many election commissions will have been intimidated, beaten up or taken hostage. In autumn 2014, the Dobropillya district could still hold a snap parliamentary election, and a year later, when the front line had more or less stabilised, they held routine local elections. At that point the first (and so far the only) “unified territorial community” (UTC) appeared, marking the start of long-awaited administrative and financial decentralisation reform in Ukraine. The UTC structure allows several smaller administrative units to group together for collective management of public infrastructure. 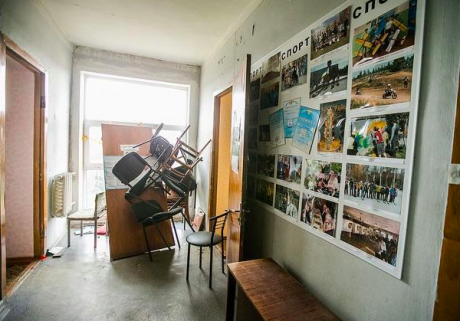 Three years on, in 2018, the Donetsk Regional Civil-Military Administration and Central Electoral Commission (CEC) decided, for the first time, to cancel planned local elections in Dobropillya on the grounds of a “terrorist threat”. One month later, after the Russian attack on Ukrainian warships in the Black Sea, Ukraine’s president and parliament announced a State of Emergency in ten of the country’s regions, including war-torn Donetsk and Luhansk. This precipitated a freeze on all political activity, including election campaigns. Finally, 31 December 2018 marked the opening of Ukraine’s official presidential campaign. On the same day, the Central Election Commission extended the existing restrictions to include the closure of all polling stations in Russia and the transfer of their operations to Ukrainian embassies in Finland, Georgia and Kazakhstan. This effectively excludes an electorate which was theoretically disloyal to President Poroshenko (including several hundred thousand refugees and labour migrants from the Donetsk and Luhansk regions). Pavlo Klimkin, Ukraine’s Foreign Minister, explained this as a necessary move against this same supposed terrorist threat. On 23 December 2018, villages administered by the large and prosperous Zolotoy Kolodyaz rural council were due to be amalgamated into the Shakhovska unified community. So-called pre-elections were planned in connection with this change; the community would have extra representation and the post of council leader would be changed to that of village head. The Dobropillya district would also acquire a second UTC, Kryvorizska. The usual procedure in these cases is for village, township and town councils to take a decision to unify, after which the decision is confirmed or rejected by the regional authorities. If it is confirmed, they then send the necessary papers to the CEC, which appoints a date for a snap local election. An election has to be held for the UTC to set up an administrative centre for itself: existing local councils in the area are then abolished. On 12 October 2018, the CEC decided to hold snap local elections in 125 newly amalgamated urban and rural communities. A few days later, however, the Electoral Commission began receiving letters from the Donetsk regional authorities, saying the planned election could not be organised and held in the area under their control because of “armed aggression on the part of the Russian Federation” and the “terrorist threat” connected with it, as well as the “complicated socio-political situation in the given district”. The CEC did not receive replies to its official requests for confirmation of this situation from higher military authorities. On 1 November, however, it took the decision to cancel the elections slated for 23 December in the Kryvorizska and Shakhovska UTCs, leaving them postponed for an indefinite period. After the presidential election in May 2014, Hennady Chetverov and his associates were subjected to a number of armed attacks: after an explosion at the gates of a friend’s home, he lost the fingers of his right hand. Unsurprisingly, he is unwilling to claim that the Dobropillya area is now completely safe, although he heard about the cancelation of the elections in the two local UTCs from the media. Local council members are cautious in their comments. If many of them were shocked by the CEC’s decision, some have also been buoyed up by it. The least happy are the leadership of the Shakhovska UTC, which would have been much strengthened by the unification programme for villages in the Zolotoy Kolodyaz area. Regional-level government has been on hold since the end of 2014. The powers formerly exercised by regional councils are now in the hands of Civil-Military Administrations (CMA), and decisions about holding local elections in this or that UTC effectively depend on their leaders. To a certain extent, the problem lies in the lack of clear criteria by which to take decisions on elections, says Oleksandr Klyuzhev, a specialist in election monitoring and electoral legislation from the Opora civil rights network. And given that no one has to justify the administrations’ discussions in public, this means they sometimes lack credibility. “If the CMA insists that there is a danger, the question arises of what measures, apart from the cancellation of the elections, are being taken to ensure people’s safety,” says Klyuzhev. Tamara Belyakina, head of the Dobropillya district council, says she hasn’t noticed any changes over the last couple of months, although she does feel there is a greater military presence. “Nothing terrible has happened in the district,” she tells me. “The decision to postpone the elections was probably a purely preventive measure. There’s nothing much I can tell you: the ‘powers that be’ know more about it.” Even Belyakina doesn’t know when elections will take place in the Kryvorizska and Shakhovska UTCs. According to Klyuzhev, the decision again needs to come from the CMA. The introduction of the State of Emergency in 10 Ukrainian regions on 26 November has, for some reason had no implications for Donetsk region. Neighbouring Luhansk has, however, been affected: the first ever elections in eight UTCs have been cancelled. Indeed, after a month of this measure, the only result was the postponement of elections, although not the presidential, as the opposition feared, but local ones. The critics of the State of Emergency that was suddenly foisted on the country after nearly five years of war turned out to be right, to an extent. This is where we come to the unofficial version of the election debacle in the Dobropillya district. In late April 2018, the Petro Poroshenko Bloc (BPP) was completely wiped out in an election in a new UTC in yet another district in the Oleksandrivka district, which also borders the Dnipropetrovsk region. The post of head of this UTC, as well as 22 of its 26 seats, fell to candidates from the Nash Krai (Our Homeland) party, which is seen as a kind of successor to Yanukovych’s Party of Regions. The BPP couldn’t get a single candidate into the Oleksandrivka UTC – a bad sign for the bloc and its leader’s future at the upcoming presidential and parliamentary elections. Rumours began to spread about an early resignation for the region’s unpopular governor Pavlo Zhebrivsky. And in early June, Poroshenko did actually fire Zhebrivsky, replacing him with Oleksandr Kutsya, a quiet presence who had previously headed the regional office of Ukraine’s Security Service. It is perfectly possible that, knowing the mood of the area and unwilling to risk a failure like his predecessor’s, Kutsya simply decided not to hold an election. The first round of the presidential election will take place in March this year, so, if the pessimistic version of the truth is true, a “terrorist threat” will hang over the Donetsk region at least until mid-spring. The Donetsk and Luhansk regions are some of the most densely populated areas of Ukraine. Before the war, they had a population of over seven million – around 15% of the 46 million electorate of the pre-war 24 Ukrainian regions plus the Crimean Autonomous Republic – who considered loyal only to “their own people”, i.e. Viktor Yanukovych, the Party of Regions and everything associated with them. No other political force has ever made any serious impression on these regions. The collapse of the Party of Regions left a gap in the Donetsk and Luhansk areas that no one could – or, more to the point, decided or wanted to – replace with any other external power. "Terrorist threat" blocks the possibility of holding elections in the east of Ukraine. Photo CC BY-NC 2.0: Sasha Maksimenko / Flickr, Slavyansk, 2014. Some rights reserved. Since 2015, politicians and political specialists in Kyiv have been saying the same thing off the record: no one wants to take the trouble and responsibility on themselves to carry out any changes whatsoever. It’s likely, in fact, that no one has any idea how it could be done. In the new regional centres, small provincial towns replacing the million-resident Donetsk and half-million-resident Luhansk, appointees from Kyiv fill the roles of the members of the former elite. In Kyiv itself, this is the fifth year without people who can speak for their region, as they could before 2014. The majority of the residents of those two regions in far east Ukraine not only failed to vote in the 2014 presidential and parliamentary elections, but have had no opportunity to elect local council members. Even routine local elections did not take place in many government-controlled towns and cities in 2015 because of the “terrorist threat”. As in the case of the Kryvorizska and Shakhovska UTCs, there seems neither rhyme nor reason for these administrative upheavals. In October 2015, for example, planned elections didn’t happen in either the district centre Kostiantynivka or in many villages in the district, including Oleksandro-Kalynove. In December 2016, the first elections took place to the Illinovsk UTC, whose centre directly borders Kostiantynivka and which also includes Oleksandro-Kalynove. In Kostiantynivka itself, no local elections took place, nor did they happen in Toretsk (formerly Dzerzhynsk), whose council head openly supported the “Russian Spring”. When he was arrested in 2016, a newly created CMA took over the running of the town. And in Bakhmut and Kostiantynivka the local council, elected in 2010, is still in charge. The region also has UTCs that have been waiting for their first elections since they were created in 2015. The CEC refers to a Parliament decision providing for elections that failed to take place in 2015 to be called not by the CEC but by the Ukrainian parliament itself, “on condition of the ending of the Russian Federation’s temporary occupation and armed aggression”. This refers to UTCs located near the front line, which were unable to hold elections in 2015 but where things have changed since. Two villages in the Dobropillya district were the first in the Donetsk region where elections were blocked, using the same pretext of Russian armed aggression, but are in fact far from the combat zone. Finally, the Donetsk and Luhansk regions officially harbour the largest number of internally displaced persons (IDPs) from areas outside the control of the Ukrainian government. Many of these people are pensioners who still live behind the demarcation line, but have needed to acquire registration in the Kyiv-controlled part of the region so they can continue to receive their Ukrainian pensions. Many of them do in fact live, and are active in their new communities, but they have no electoral rights there since they still officially belong to towns and villages outside government control. It’s difficult for someone who has been forcibly displaced to change their registration papers, especially if he or she doesn’t have their own home in their new area. Paradoxically, IDPs can still stand as candidates in local elections, and there have been cases in Ukraine where they have been able to exercise these rights. One such is architect Stanyslav Koval, who had to move from Donetsk to the Kostiantynivka area and became a member of the IIlinovsk UTC council; he once joked to me that he couldn’t vote for himself at local elections. But discussions over all the nuances of local government in the Donetsk and Luhansk regions may become irrelevant in a few weeks, as even with the ending of the State of Emergency on 26 December, the region is under threat of losing the right to any participation in any upcoming elections. On 20 December, the CEC wrote to the Donetsk and Luhansk CMAs, requesting they be allowed to organise and hold presidential elections on their home territory. They have had no response from the regional government department. Current president Petro Poroshenko, who is looking for a second term in office, is lagging behind ex-PM Yulia Tymoshenko in the popularity stakes. In the case of a runoff, however, a small percentage of voters can, as has happened many times in Ukraine, swing the vote. Someone seems to have decided that a Poroshenko victory could be guaranteed by debarring the two “disloyal” regions, Donetsk and Luhansk, from the presidential election. In that case, the cancellation of the 23 December election in the Dobropillya district will have just been a rehearsal for the real thing. The population of the Donetsk and Luhansk regions is demoralised and worn down by five years of armed conflict, economic depression and isolation from regional and national political processes. The declaration of a “terrorist threat” means a moratorium on any mass protests, of which there are few enough in any case. At the level of Kyiv, supporting these regions politically is not a popular cause: many citizens, including the most “patriotic” voters on whom Poroshenko relies for support, still regard the residents of Donetsk and Luhansk as directly or indirectly responsible for the war. The most radical have indeed spoken out more than once about limiting their voting rights. In other words, the forced non-participation of the Donetsk and Luhansk regions in this year’s presidential and parliamentary elections will have no negative repercussions for Ukrainian internal politics.